O Lord and Master, Jesus Christ, our God, Fountain of life and immortality, Creator of all things visible and invisible; Consubstantial and Co-eternal Son of the eternal Father, who in thine exceeding great love didst become incarnate in the latter days, and was crucified for us ungrateful and wicked children, and by thine own Blood didst renew our nature corrupted by sin; Do thou, O Immortal King, receive me, a repentant sinner; incline thine ear unto me and hear my prayer. I have sinned, O Lord, I have sinned against heaven and before thee, and I am not worthy to lift up my eyes to the majesty of thy glory, for I have affronted thy goodness, and broken thy commandments, and disobeyed thy laws. But thou, O Lord most loving, long-suffering and merciful, hast not given me over to perish in my sin, but dost ever await my return. For, O Thou who lovest mankind, thou hast said, by thy Prophet, that thou hast no pleasure in the death of a sinner, but rather that he should turn from his wickedness and live. Thou dost not desire, O Master, to destroy the works of thy hands or that they should perish, but willest that all men should be saved and come to the knowledge of the Truth. Wherefore I, although unworth both of heaven and of earth and of this temporary life, even I, a wretched sinner who had given myself over to every evil desire, despair not of salvation, though I have been wholly subject to sin, a slave to passion, and have defiled thine image within me, who am thy creation and thy work; but trusting in thine infinite compassion, draw nigh unto thee. Receive me, O Lord, thou that lovest mankind, as thou didst receive the sinful woman, the thief, the publican and the prodigal son. Take away the heavy burden of my sins, O Thou that takest away the sins of the world, and healest the infirmities of men, and callest all that are weary and heavy laden to thyself and givest them rest; thou that camest not to call the righteous but sinners to repentance, cleanse thou me from all stain of body and soul and teach me to fulfill holiness in thy fear, that with the witness of my conscience pure, I may receive a portion of thy Holy Gifts, and be united to thy Holy Body and Precious Blood, and may have thee, with thy Father and Holy Spirit, dwelling and abiding in me. And grant, O Lord Jesus Christ, my God, that the partaking of thy precious and Life-giving Mysteries may not be to my condemnation, nor may not through the weakness of my soul and body be received unworthily; but grant that, even unto my last breath, I may partake of a portion of thy Holy Gifts without condemnation, unto the Communion of thy Holy Spirit, as a preparation for eternal Life and for a good defence at thy dread Judgement Seat; so that I, together with all thine elect, may also receive those incorruptible good things which thou hast prepared for them that love thee, O Lord; in whom thou art glorified forever. Amen. 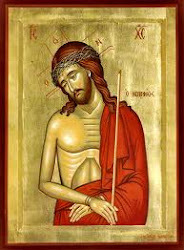 O Lord, I know that I am unworthy to receive thy Holy Body and Precious Blood; I know that I am guilty, and that I eat and drink condemnation to myself, not discerning the Body and Blood of Christ my God. But trusting in thy loving-kindness I come unto thee who hast said: He that eateth my Body and drinketh my Blood shall dwell in me and I in him. Therefore, O Lord, have compassion on me and make not an example of me, thy sinful servant. But do unto me according thy great mercy, and grant that these Holy Gifts may be for me unto the healing, purification, enlightenment, protection, salvation and sanctification of my soul and body, and to the expulsion of every evil imagination, sinful deed or work of the Devil. May they move me to reliance on thee and to love thee always, to amend and keep firm my life; and be ever in me to the increase of virtue, to the keeping of the Holy Spirit, and as a good defence before thy dread Judgement Seat, and for Life Eternal. Amen. O Lord my God, I know that I am not worthy nor sufficient that thou shouldest enter under my roof into the habitation of my soul, for it is all deserted and in ruins, and thou hast not a fitting place in me to lay thy head. But as from the heights of thy glory thou didst humble thyself, so now bear me in my humility; as thou didst deign to lie in a manger in a cave, so deign now also to come into the manger of my mute soul and corrupt body. As thou didst not refrain from entering into the house of Simon the leper, or shrink from eating there with sinners, so also vouchsafe to enter the house of my poor soul, all leprous and full of sin. Thou didst not reject the sinful woman who ventured to draw near to touch thee, so also have pity on me, a sinner, approaching to touch thee. And grant that I may partake of thine All-holy Body and Precious Blood for the sanctification, enlightenment and strengthening of my weak soul and body; for the relief from the burden of my many sins; for my preservation against all the snares of the devil; for victory over all my sinful and evil habits; for the mortification of my passions; for obedience to thy Commandments; for growth in thy divine Grace and for the inheritance of thy Kingdom. For it is not with careless heart that I approach thee, O Christ my God, but I come trusting in thine infinite goodness, and fearing lest I may be drawn afar from thee and become the prey of the wolf of souls. Wherefore I pray thee, O Master, who alone art holy, that thou wouldest sanctify my soul and body, my mind and heart and reins, and renew me entirely. Implant in my members the fear of thee, be thou my helper and guide, directing my life in the paths of peace, and make me worthy to stand at thy right hand with thy Saints; through the prayers and intercessions of thine immaculate Mother, of thy Bodiless Servitors, of the immaculate Powers, and of all the Saints who from all ages have been well-pleasing unto thee. Amen. O Lord and Master Jesus Christ, our God, who alone hath power to forgive the sins of men, do thou, O Good One who lovest mankind, forgive all the sins that I have committed in knowledge or in ignorance, and make me worthy to receive without condemnation thy divine, glorious, immaculate and life-giving Mysteries; not unto punishment or unto increase of sin; but unto purification, and sanctification and a promise of thy Kingdom and the Life to come; as a protection and a help to overthrow the adversaries, and to blot out my many sins. For thou art a God of Mercy and compassion and love toward mankind, and unto Thee we ascribe glory together with the Father and the Holy Spirit; now and ever, and unto ages of ages. Amen. I stand before the gates of thy Temple, and yet I refrain not from my evil thoughts. But do thou, O Christ my God, who didst justify the publican, and hadst mercy on the Canaanite woman, and opened the gates of Paradise to the thief; open unto me the compassion of thy love toward mankind, and receive me as I approach and touch thee, like the sinful woman and the woman with the issue of blood; for the one, by embracing thy feet received the forgiveness of her sins, and the other by but touching the hem of thy garment was healed. And I, most sinful, dare to partake of thy whole Body. Let me not be consumed but receive me as thou didst receive them, and enlighten the perceptions of my soul, consuming the accusations of my sins; through the intercessions of Her that without stain gave Thee birth, and of the heavenly Powers; for thou art blessed unto ages of ages. Amen. I believe, O Lord, and I confess that thou art truly the Christ, the Son of the living God, who didst come into the world to save sinners, of whom I am chief. And I believe that this is truly thine own immaculate Body, and that this is truly thine own precious Blood. Wherefore I pray thee, have mercy upon me and forgive my transgressions both voluntary and involuntary, of word and of deed, of knowledge and of ignorance; and make me worthy to partake without condemnation of thine immaculate Mysteries, unto remission of my sins and unto life everlasting. Amen. 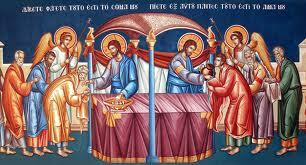 Of thy Mystic Supper, O Son of God, accept me today as a communicant; for I will not speak of thy Mystery to thine enemies, neither will I give thee a kiss as did Judas; but like the thief will I confess thee: Remember me, O Lord, in thy Kingdom. Not unto judgement nor unto condemnation be my partaking of thy Holy Mysteries, O Lord, but unto the healing of soul and body. Αναρτήθηκε από amphilochios στις 8:27 μ.μ. Ακολουθία οσίας Ξένης (24 Ιανουαρίου).